US East Coast Winter Storms: Are They Becoming More Extreme? Bernhardt, J.E. and DeGaetano, A.T. 2012. Meteorological factors affecting the speed of movement and related impacts of extratropical cyclones along the U.S. east coast. Natural Hazards 61: 1463-1472. The authors write that "East Coast Winter Storms (ECWS), commonly known as nor'easters, are among the most severe weather phenomena to impact the Northeastern United States," noting that "these storms may bring heavy precipitation (Frankoski and DeGaetano, 2011), strong winds, and flooding to coastal and interior areas of the eastern seaboard (Davis et al., 1993)." And with respect to their degree of "extremeness," they say that stronger storms generally move faster than weaker storms. However, they also write that "slow-moving storms can be especially problematic, as their extreme impacts may last longer, particularly in terms of storm surge and coastal flooding occurring over multiple tidal cycles." Therefore, it could validly be argued that either an increase or a decrease in the rate of a nor'easter's movement could be a sign of their becoming more extreme, which makes them the ideal type of storm for climate alarmists to use as an example of storms becoming more extreme in response to global warming; for the only way their claim could be refuted would be for the mean rate of movement of each year's set of nor'easters to be maintained - in the mean - over the long term. In an earlier study, as Bernhardt and DeGaetano describe it, "Hirsch et al. (2001) defined an ECWS as an area of low pressure with a closed circulation, moving in a general south-southwest to north-northeast direction and containing winds greater than 10.3 m/sec during at least one 6-hour period," which wind criterion was selected because "it represented a threshold for wave damage given by Thurman (1983)." In addition, they state that the system had to be located along the East Coast, in a box bounded at 30°N by 75 and 85°W and at 45°N by 65 and 70°W. And based on this definition, they calculated the speeds of all ECWS over the 55-year period 1951-2006. The two US researchers report that "the speed of ECWS during their passage over or near the east coast of the United states varied substantially from storm to storm, month to month, and season to season." However, as can be seen from the figure below, over the entire time period of their study, Bernhardt and DeGaetano rightly declare "there was no clear trend in ECWS speed." Average seasonal nor'easter storm speed. Adapted from Bernhardt and DeGaetano (2012). 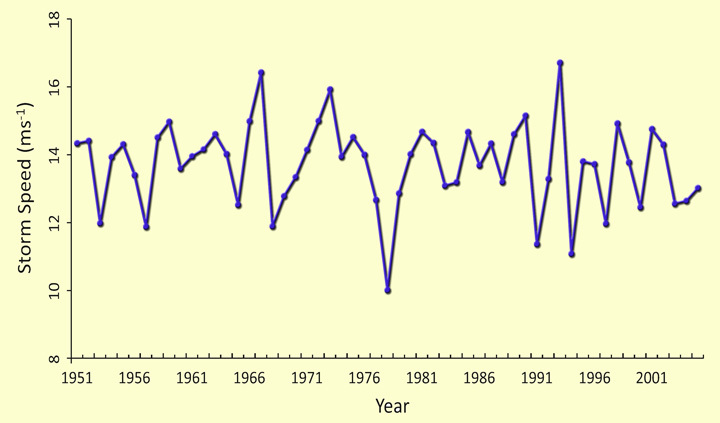 Against all odds, as one could rightly claim in this particular instance, the global warming that occurred between 1951 and 2006 did not lead to an increasing trend in the extremeness of East Coast Winter Storms. Davis, R., Dolan, R. and Demme, G. 1993. Synoptic climatology of Atlantic coast northeasters. International Journal of Climatology 13: 171-189. Frankoski, N. and DeGaetano, A. 2011. An East Coast winter storm precipitation climatology. International Journal of Climatology 31: 802-814. Hirsch, M., DeGaetano, A.T. and Colucci, S.J. 2001. An east coast winter storm climatology. Journal of Climate 14: 882-899. Thurman, H.V. 1983. Essentials of Oceanography. Merrill, Columbus, Ohio, USA.